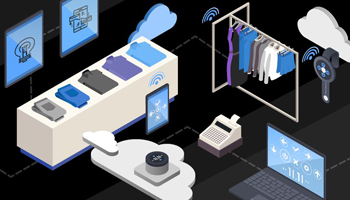 Digital transformation in retail is rapidly unfolding as companies tap new technologies to offer consumers the personalized, real-time digital capabilities that they demand. A recent survey from JDA found digitization was a high priority, with nearly 70 percent of executives saying they plan to increase their digital investments in the coming year. Regardless of the technology or solution being deployed, most retail transformation initiatives strive to create a more personalized customer experience. Personalization is causing a “seismic shift across the landscape of consumer-facing brands, and we are only starting to feel the shocks,” explains Boston Consulting Group. Through IoT, mobile applications, beacons and new POS systems, retailers are learning more about their customers to better predict what they desire and how they can improve the individual experience. Digital advancements will be key to brick-and-mortar store success along with seamless, personalized experiences across all channels, Kevin Swank, director of industry marketing for Black Box Network Services told Retail Touchpoints. Deloitte reports that more than 90 percent of consumers now use their phones in the shopping process, and according to Think With Google they’re also using their phones as an “in-store research adviser.” More than 80 percent of shoppers consult their phones on purchases they’re about to make in a store, and a quarter of those said they’ve even changed their mind while standing in line after looking up details. Successful retailers are now proactively boosting their in-store experience with their own mobile initiatives to be a larger part of the conversation. Sephora continues to thrive in its space by making its innovative mobile app a strong part of the in-store experience. Customers can now use the app to scan their faces and find products that match their skin tones and make-up preferences. Increasing information access through a mobile in-store experience can not only keep consumers engaged with specific products, but also bring another level of personalization and education about what’s available in-store. Another growing trend is moving away from giant clunky registers permanently bolted to front counters. Many successful digital retailers are now deploying compact tablet-based POS systems that are flexible, mobile and can be used to not only process transactions, but enhance customer service. This can help store associates process payments during peak business hours, or quickly be able to check inventory without having to shuffle through the backroom. Discover how you can create the retail experience of the future in this white paper. Consumers are also demanding greater flexibility in payment methods. A recent report by PYMNTS.com revealed mobile wallet adoption is on the rise. Options such as Samsung Pay can offer a higher level of convenience and security than cards, and they can easily be tied to reward systems. The ability to BOPIS is moving from a niche offering to an expectation in mainstream retail. KIBO Commerce revealed more than half of consumers will rely on BOPIS options in the 2017 holiday season, a 25 percent increase over the previous year. Consumers say they use BOPIS to save on shipping costs, save time while in-store and get the product when it’s convenient. Many are also using retail websites to access online inventory and use that information to justify a store visit. Retailers are striving to improve their BOPIS capabilities and investing more in technologies to ensure it operates smoothly, said Lee Gill, group vice president, Global Retail Strategy at JDA. “If shoppers experience a problem with home delivery on in-store pickups, that is a lost sale — and customer — that retailers can’t afford in a highly competitive market,” added Gill. Digital retail trends also include the growing use of beacons. Retailers such as Rite Aid, Target, Macy’s, Urban Outfitters, Walgreen’s and Best Buy have all rolled out new beacon deployments in the past year. ABI Research predicts that the beacon market for retail will reach 500 million units by 2021. When consumers use opt-in mobile apps, beacons can reach them on their devices as they enter the store, making it easier for them to quickly find what they want, notifying them of sales on specific items they might be looking at in-store. Retailers that are currently using the technology said it helps them understand customer browsing and buying patterns, improve engagement and create more relevant offers for customers. It may have been considered a side note in the past, but the growing prevalence of cyberattacks and data breaches is making digital security a top priority for many retailers. Data breaches of sensitive customer information and card data can result in lawsuits, financial loss, brand damage and a loss of consumer trust. More retailers are putting security front and center in all of their digital initiatives, from their in-store WiFi to their mobile apps and POS systems. Retailers must better assess vendor risk, implement continuous monitoring, ensure protection of POS systems and improve cybersecurity awareness, explains Sam Kassoumeh, co-founder and COO of SecurityScorecard. Whether retailers are ready or not, consumers have become hooked on the real-time, personalized world of the digital landscape. Following the path of digital transformation can help retailers better serve their customers and compete in the market.